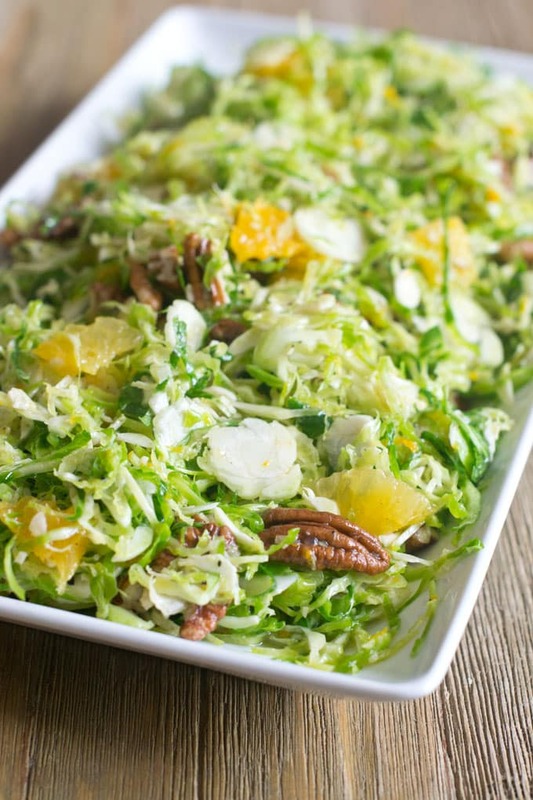 A winter take on coleslaw that uses Brussels sprouts, oranges and pecans. We’re talking about Brussels Sprouts here on The Cookful right now. Two weeks of Brussels sprouts tastines! Today, we’re going a bit crazy and not even bothering to cook them. Yes, it’s true. You can eat Brussels sprouts raw. Now, you wouldn’t want to stick a whole one in your mouth and munch away. Brussels sprouts are a lot like cabbage and I sure as heck don’t want to eat cabbage like an apple. Instead, you shred it finely, toss it with a vinaigrette to make coleslaw. And that’s exactly what we’ve done here. To shred it we used a mandoline. We tried a box grater and it didn’t do a great job. If you don’t have a mandoline, get out a sharp knife and slice as finely as you can. But wait, if you don’t have a mandoline, we highly recommend this Hand-Held Mandoline Slicer from OXO. It’s not a full-on big mandoline machine. It’s a compact, easy to use, inexpensive ($14.95) tool to have on hand for those times when you need a lot of thin slicing. 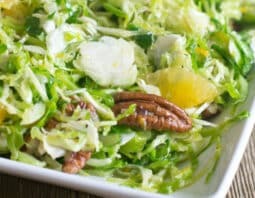 A bit about the flavors in the Brussels Sprouts Slaw: The shaved raw sprouts have an unexpectedly delicate flavor. We kept the dressing really simple so that it would shine through. It’s just lemon juice, orange juice, olive oil, salt and pepper. Nuts go very very well with Brussels sprouts so we added pecans. And for more citrus and to really tie in the wintry feel of this recipe, we added navel orange segments. Chopped mandarines or clementines work too. Shred Brussels sprouts thinly on mandolin (we used the #2 setting on this OXO slicer). Zest one orange and segment both oranges, squeezing the juice from the remaining center of the orange into a large bowl. Add the orange pieces and zest to the Brussels sprouts. To the bowl of orange juice add salt, olive oil, lemon juice and pepper. Whisk to combine. Add Brussels sprouts mixture and pecans. Toss gently to coat and serve.